Former FBI director James Comey torched what remains of President Donald Trump’s credibility Thursday afternoon, calling him a liar at least five times in three hours of testimony before the Senate Intelligence Committee. Trump’s claims that he fired Comey because of chaos and poor morale at the FBI “are lies, plain and simple,” the former FBI boss declared. He kept notes about his conversations with Trump, Comey said, because “I was honestly concerned he might lie about the nature of our meeting.” He denied Trump’s claims, in an interview with NBC’s Lester Holt, that Comey had asked the president to have dinner in order to make the case to keep his job. In fact, Trump asked for the dinner, where he repeatedly demanded “loyalty” from the independent Justice Department official. It should also be noted that, according to Comey, never once in their nine conversations did Trump express concern or curiosity about the scope or nature of Russia’s involvement in hacking Democratic organizations during the 2016 elections. In several comments, Comey made plain that he considered Trump’s suggestion an “order,” quoting Henry II’s famous, menacing quote about Thomas Becket, “Will no one rid me of this meddlesome priest?” (Becket wound up dead two days later.) It was not an inapt comparison, though it did serve to remind us of Comey’s high self-regard. Comey’s testimony that he considered Trump’s meddling in the Flynn investigation “an order” could be crucial evidence of obstruction of justice if Mueller decides to pursue such a charge. 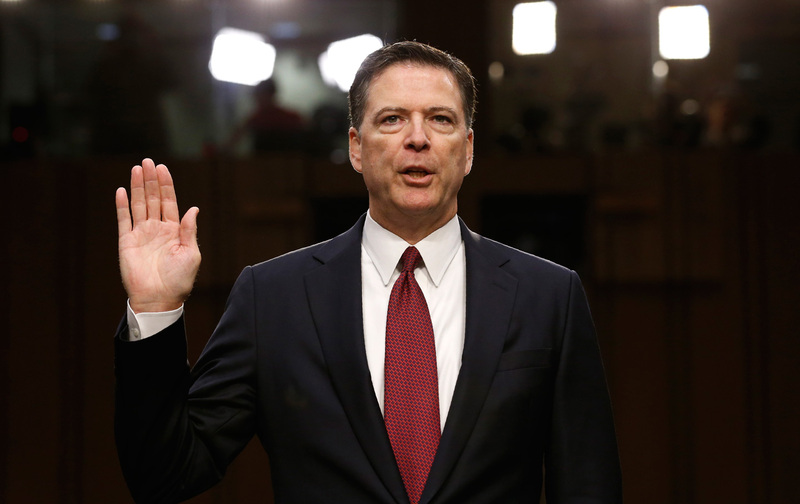 The former FBI director seemed to step on his own headlines Wednesday night, when he authorized the Senate Intelligence Committee hearing to release his prepared testimony. On first read, there were few bombshells—only because The Washington Post and The New York Times had each been fed several shocking stories drawing on Comey’s memos documenting his meetings with Trump and Trump’s multiple requests for Comey’s loyalty, as well as his efforts to influence or even in one case quash the FBI’s investigation into his campaign and top advisers. On social media, many people immediately thought of the infamous line from Goodfellas, “I took care of that thing for you.” (Personally, I went to Lauryn Hill.) New Jersey Governor Chris Christie tried to reassure MSNBC: “What you’re seeing is a president who is now very publicly learning about the way people react to what he considers to be normal New York City conversation.” Normal New York City conversation? For mobsters, maybe. Mafia dons expect loyalty; presidents know the FBI director operates independently from the White House. Comey told McCain that he interpreted “that thing” as a reference to their early conversations about “loyalty” and Comey’s remaining in his job, as though Trump had done him a favor by keeping him on. But Comey said he couldn’t be sure. None of us can. What we can be sure of, unfortunately, is that Comey’s testimony won’t move the GOP toward action to rein in Trump. It gives the rest of us a little bit more insight into what independent counsel Mueller may be seeing; it may give us hope that the investigation will hit its targets. But this process is likely to move slowly, as long as GOP leaders, such as House Speaker Paul Ryan, defend Trump’s Comey coercion as the actions of a neophyte who “was new at this” FBI-independence stuff. They’ll defend him until he hurts them more than he helps, and who knows when they’ll decide that will be?